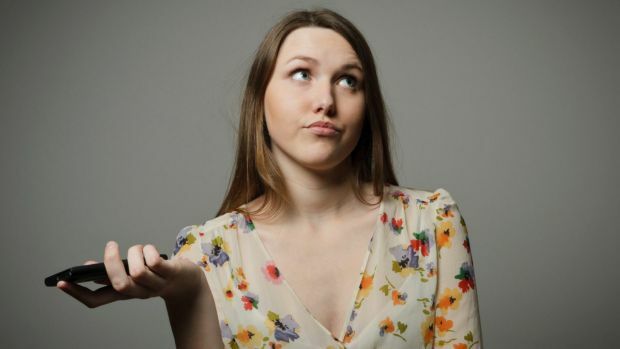 You already know social media marketing is a channel that can drive traffic and sales, but the question is: are you actually seeing an increase in traffic or sales? Chances are you are not. Why? Because you are using obsolete tactics that aren’t effective anymore. Posting daily or whenever you have time isn’t ideal. Why? Because your followers may not be online when you are posting. That means no one is going to see the content you are promoting. Simply Measured has some free tools that show you when you should be posting. It will analyze your user base and tell you the days and times the most optimal for engagement. Once you figure out the ideal days and times you should be posting, sign up for Buffer (free), and start scheduling your posts. Facebook posts are the exception. If you schedule them, you’ll see your share and like counts drop. 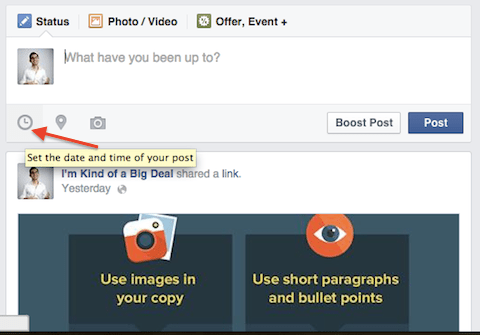 Instead, you’ll have to post on your Facebook profile yourself and schedule posts through Fan page by clicking the clock icon. Once you have a big following, you’ll want to start convincing them to buy whatever you are selling. But just posting a link, telling your followers to buy your book, product, or service, won’t do much for you. The only time I’ve seen it work is when a sale or a discount is offered, which isn’t an ideal scenario. What you need to do is drive your social media fans through a funnel. First, collect their emails, and then offer your products or services through email. A good example of this is Josh Flagg. He started driving people to a blog, where he collected emails. Within a few months, he collected just over 2,000 emails. He then launched a webinar course for $499 dollars, and within 24 hours, he made $12,974 in sales. When he promoted his webinar product directly to the group, he didn’t even generate $1,000 in revenue. The reason this works is because you are getting your fans to make micro commitments. Eventually, when you ask them to make a purchase, they are more likely to say yes. I’m continually seeing people follow thousands of users in order to build up their accounts on sites like Facebook and Twitter. Some people even go as far as buying thousands of fans. The big numbers may make you look cool, but they will eventually hurt you. Why? These social sites are getting smart at analyzing how many of your followers are actually engaging. And if the ratio is poor, your content won’t spread much, which will cause you to get less traffic compared to having a smaller fan base that actually engages. So, instead of trying to game the system, start looking at your competitors. See what types of content they are posting that causes engagement. Test posting similar types of posts. And avoid posting content that doesn’t get likes, comments, or shares. So, how do you ensure your site is optimized? You add social media meta tags to your content. The difference is huge. 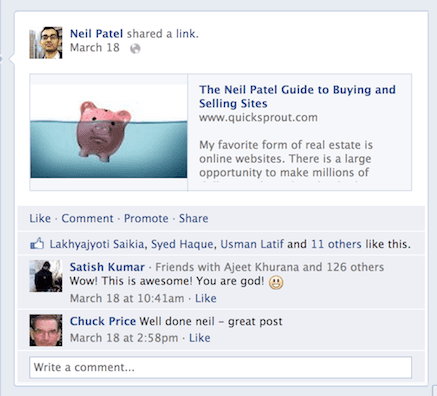 When I implemented this on Quick Sprout, my Facebook traffic went up by 174%. I started participating on social sites because I wanted to grow my brand, traffic, and sales. I didn’t really care about anything else, and people saw it. People started to unfriend and unfollow me, and I wasn’t getting any social traffic. But once I started sharing other people’s content, answering questions, and just helping people out, I quickly noticed that I started to build a loyal following. The loyal following eventually converted into traffic and sales once I started to build a funnel similar to Josh Flagg’s. But when I was just being self-promotional, I didn’t generate one sale. Make sure you help people out, answer their questions, and share content from others within your industry. You don’t have to promote competitors, but you should be promoting news and content sites. When you share someone else’s link, you are driving traffic to their site and generating no traffic in return. That kind of blows. What if I told you that every time you promote someone else’s site, you can actually drive more traffic back to your site? 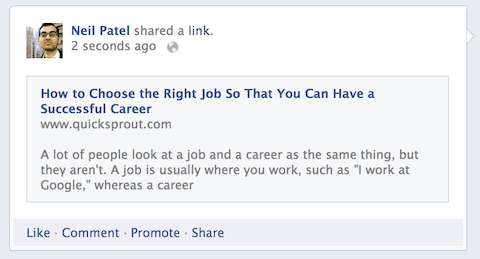 There is a cool social tool called Sniply, which puts a promotional box on any site you share. When you drive traffic to others, there is a chance that some of those visitors will come back to your site. If you want people to share articles on your site, what do you do? Add social sharing buttons to your site, right? But did you know adding one too many social buttons to your site can hurt your traffic? I tested placing 3, 4, and 5 different social media options on Quick Sprout. When I reduced the button count from 5 to 3, I was able to increase my click-through rate by 11%. So, instead of treating your site like Nascar and promoting every social site out there, focus on just 3. Pick the sites that resonate most with your readers. Chances are it is going to be Facebook, Twitter, and one other social site. And if you are wondering what kind of social buttons you should be using, try the plugin Flare. It’s flexible, it looks pretty, and it’s free. YouTube is hoping to get back on side with creators with the release of their Fan Finder feature. The site is offering creators the opportunity to produce Channel trailers as skippable TrueView ads which will appear across a range of videos. YouTube rolled out their Top Fan feature a while back which (whisper it) integrates very nicely with Google+ but this new initiative stays within the site and gives the chosen creators a chance to reach a wider, but carefully targeted audience. All users need to do is produce a promo, upload it to Fan Finder and YouTube will turn it into a TrueView video ad (if it’s good enough? Not much info regarding a selection process). Keep your channel ad short and engaging: Introduce the viewer to your content; don’t assume they have heard of you or your channel before. Remember, your channel ad will run as a TrueView ad which the viewer can skip after 5 seconds, so get to the point. Entertain the viewer: When in doubt “show” what your channel is about, don’t “tell”. If you have a comedy channel make sure your ad is funny, if you have a music channel make sure your ad has music. You get the drift. Aim for a strong message: Keep your channel ad focused on your channel and why viewers should subscribe or check out your content. Have a clear call to action: What do you want your viewers to do? This should be scripted and annotated in your channel ad. Don’t forget to explain what subscribe means (example: “Want to see more content? Subscribe here”). Branding matters: Make sure your branding is clear and reiterated throughout the ad. You want viewers to remember your channel. Don’t Miss Out – Join Our VIP Video Marketing Community! Get daily online video tips and trends via email!